In present business situation, companies are bound to go for the effective management of innovation. To become inventive, companies must have to develop new products and do it rapidly. Innovation and its ability to generate competitive advantage for companies is main concentration. Through an introduction to the theory and practice of innovation, personnel will learn to develop an innovative attitude. Innovation has evolved as a new set of key metrics for a business, more than traditional cost and structure-based metrics. Many scholars define innovation is a process by which new information is created, and it is this information that is embodied in the product. Theorists explained that innovation facilitates entrepreneurs to explore a new opportunity. The process that results in innovative ideas consists of two consecutive steps, imitation and invention (Godin, 2008). Baregheh, Rowley and Sambrook (2009) describe that "Innovation is a generation, which can accept and realize new ideas, products or services" ( Thompson, 1965, p. 2). 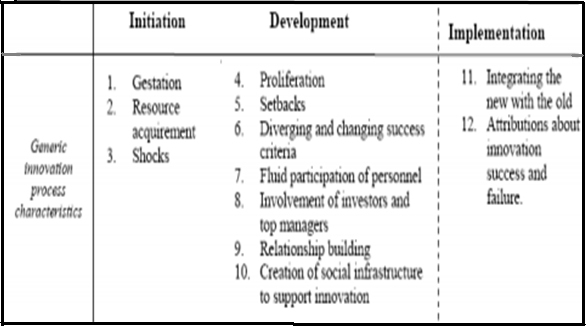 According to Baregheh, Rowley and Sambrook (2009), Innovation is conceived as a means of changing an organization, either as a response to changes in the external environment or as a pre-emptive action to influence the environment. Consequently, innovation includes a range of types, including new products or services, process technologies, organizational structures, administrative systems, plans or programs pertaining to organization members. Damanpour and Aravind (2012) wrote that an organization adopting innovations are "aware of new ideas, acquires, adapts, and uses them". Innovation is the acceptance of a new product, service, technology or practice in an organization, expectantly creating a competitive advantage. Innovation management allows the organization to respond to external or internal opportunities, and use its creativity to initiate new ideas, processes or products. Managers have to contribute a lot to manage a company efficiently through innovation and perform structured and informed analysis. Each innovation has different aspects, some denotes to its value proposition, other innovation to its future users, some to probable responses from its competition. An innovation can not be successful if company concentrate on one-sided focus on these aspects. Mangers need to learn about the processes to recognize ideas for innovation, strategies in different types of companies as well as how innovation can become a part of the overall strategy of a company. It is necessary to gain knowledge on how to put innovation on the corporate strategy programme. Innovation management is management of the innovation process such as the analysis, documentation, and control of change within an organisation. Innovation management is usually done at the management level of an organisation and deals with generalization that affect the whole organisation, rather than specifics, which affect only a small part of the organisation. This trend might take form of alterations in corporate policy, lines of business to follow, or employee policy. The innovation management began around the 1930s by the Austrian economist Joseph Schumpeter, who assumed that innovation is important for economic growth (Betz, 2011, p. 33). In his book "Capitalism, Socialism and Democracy", he described the term "creative destruction" (Innovation Zen, 2014). Innovation management makes organizations grasp an opportunity and use it to generate and initiate new ideas, processes or products industriously (Kelly and Kranzburg, 1978). Creativeness is the basis of innovation management and the next step is to put the ideas to action, leading to a change in services or business process. Through innovation management tools, management can activate and organize the creative ability of the personnel for the continuous development of a company. Common tools include brainstorming, virtual prototyping, product lifecycle management, idea management, TRIZ, Phase gate model, project management, and product line planning and portfolio management. The process can be seen as an evolutionary integration of organization, technology and market by iterating series of activities such as search, select, implement and capture. Personnel can learn the skills of managing innovation and business development projects, such as attracting venture capital and making budgets and draft and assess business plans. It will assist to design own feasible project, but also to assess the quality of projects presented to company by others. Innovation management has been closely related to knowledge management (Coombs and Hull, 1998). 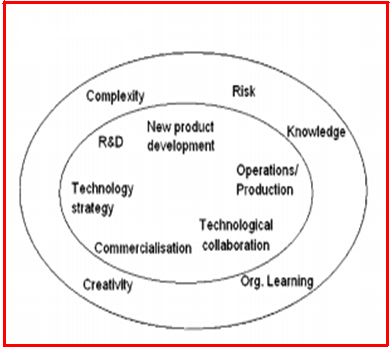 Freeman and Soete (1997) incorporated in the innovation process all those activities which are encouraging the commercialisation of new technologies. 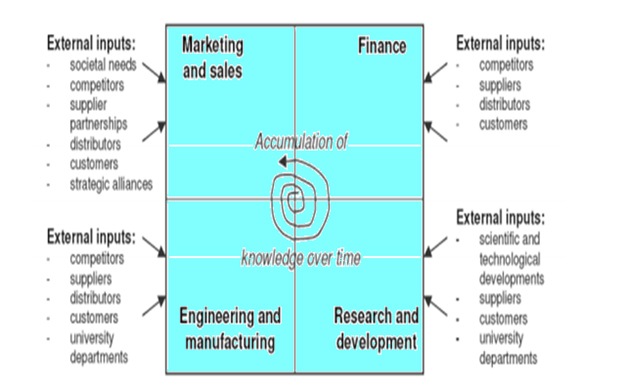 Dogson (2000) recommends a holistic model that includes six specific areas in the management of technology innovation, R&D, new product development, commercialisation of innovation, operations and production, technological collaboration and technology strategy. He designated that the framework of Management of Technology Innovation is intricate and unsafe. The major problems associated with uncertainty, knowledge and costs unpredictability. As a result, firms trying to develop organizational competitiveness in innovation will need knowledge management and organizational skills in order to learn quickly. Global companies undergo with numerous problems with the pace of innovation and change increasing. The most common obstacle to innovation is resource limitations, mainly due to lack of available finances. Another problem is lack of manpower, and thirdly time constraint. This barrier can only be broken when an organisation decides to innovate and makes the resources available. The major issue in managing a fundamental innovation is the need for a new attitude. Very often, successful innovators are the ones with fewer resources and no particular strengths in scientific or technological discovery. Another vital innovation problem involves the process of implementing and institutionalising an invention or creative idea so that it truly becomes an innovation. The academic literature on the socio-political processes of pushing ideas into currency appears to offer insights into why some new ideas gain acceptance while others do not. Bower, et, al., stated that a significant problem with fundamental innovation is that it often does not meet existing customers' requirements, or meet current management's expectations concerning market share or profitability. An innovative idea may take time to develop, and/or it may need different business considerations, such as that the profitability may be lower. There are several well-known models for innovation management within an organisation. Majaro - Innovation Funnel: Majaro describes innovation as the practical application of ideas towards meeting an organisation's objectives in an effective manner. He stated a four-stage process involving idea generation, idea screening, feasibility study, and commercialisation. Famous model that can be categorized as a fourth generation model is the Minnesota Innovation Research Program (MIRP) model which was developed in the decade of the 1980s . The MIRP model describes the sequence of key characteristics that are revealed as an innovative idea is transformed and implemented into a concrete reality. Each cycle comprises of three successive periods: an initiation period, a development period and an implementation period. Each of these periods is distinguished from each other on the basis of specific process characteristics. Network models originated in the 1990's and tried to explain the complexity of the innovation process. Major characteristics of the network model are the influence of external environment and the effective communication with external environment. Organizations that do not innovative management system, lack the capability to deal with the nature and power of competition within the market therefore get loss in market share and productivity. Innovative companies are competent of monitoring and understanding changes in industry competitive capabilities such as new processes and new technologies thus implementing research and development activities that will enable the firm to obtain those competencies (Shavinina 2003). Lack of innovation in enterprises is related with market failures such as inadequate ability of the firm to capture rents and profits that are created through innovation. In this case, lack of innovation will limit research and development activities that intend to create innovative incentives such as ability to deal with externalities. Consequently, the firm can not deal with supply and demand deficiencies therefore leading to high prices or continuous changes in the price levels and affect strategic planning in the organization (Fuglsang 2008). Lack of innovation will obstruct the firms to attract and maintain high skilled employees. This can lead to low employee motivation among employees due to regular tasks, negative perceptions towards the organization, low skills level, poor compensation and complete resistance to change by the management (Fonseca 2003). Management must have to explore the way to increase innovation within the organization to compete with new products and services from around the world that can quickly reduce the organization's profits. An organization's capability to compete is directly related to increase its operational efficiency. An organization needs to improve productivity reduce costs, and improve profitability. More resourceful processes means less waste and a higher output for the resources invested. Most organizations focus on incremental innovations, which are essential in improving existing products and services to meet current customer expectations. Incremental innovation is the normal method to improve operational efficiency and it has been demonstrated to be effective. Management must able to accept radical innovation, implement it using compatible management processes, and develop new markets. The new innovation must be allowed to creatively destroy the current market before another business does. It may seem counterintuitive because it reduces a profitable business line, but it will allow the organization to build a new market. It is recommended that Management needs to make sound financial decisions concerning the resources and profit. The conflict arises when sound and logical business decisions do not take into account adopting radical innovations that could profit the organization even if it creatively destroys part of the existing market. To summarize, Innovation is vital for the long-term success of organizations. It is explained as the development and implementation of new ideas by people who are engaged in transactions with others within the institutional order. Managing for innovation requires knowledge and skills which are different from those needed in every day business. Management nowadays faces a difficult situation where innovations are increasing competition, which means they need to explore to increase innovation development within the organization. Incremental innovations are essential for improving existing products and services and for making operations more efficient. Radical innovations, which can change the market significantly, are essential and management must find ways to increase them within the organization before another organization creatively destroys the existing market. Effective management of innovation is significant for businesses in competitive market. Innovation management explains the decisions, activities, and practices that shift an idea to realization for the purpose of generating business value. Basically, it is managing the asset to create new opportunities to add customer value that are needed to maintain and grow the business. Usually, innovation investment focuses on the development of new products, services, or technologies. However, the types of innovation that can augment business results go well beyond these, including changes to a company's business model. Major objectives of innovation management are identifying and making these investments successfully.